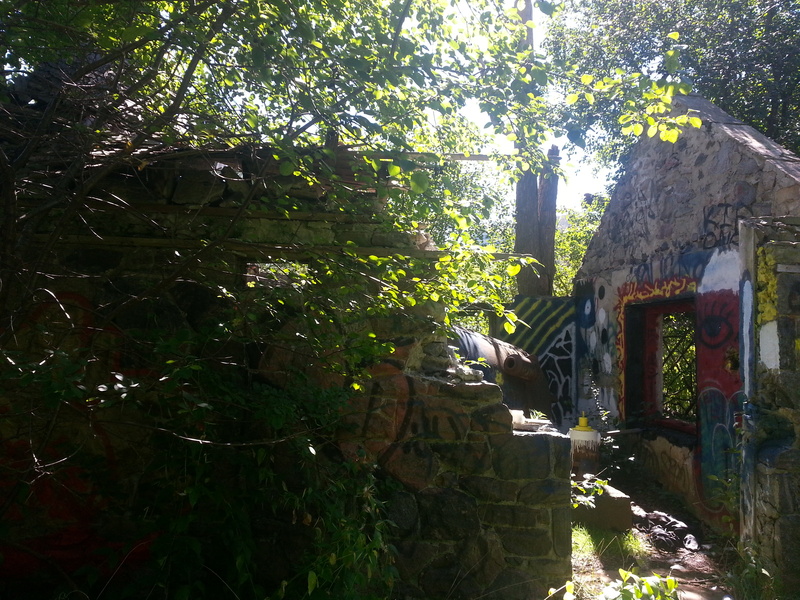 Hearing about a couple of old abandoned structures in the middle of a ravine, I explored the Duncan Mill Ruins while on my walk of the adjacent Betty Sutherland Trail. 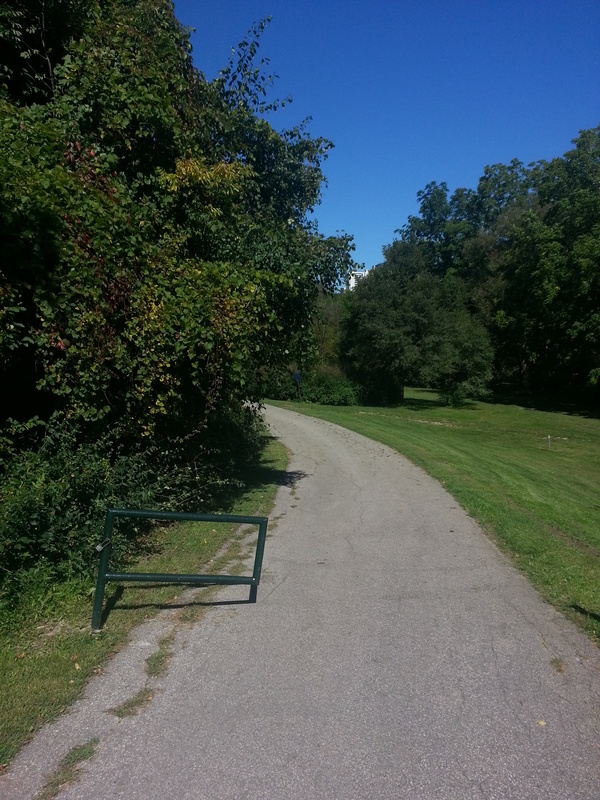 I entered from an unmarked yet paved path on the east end of the bridge on Duncan Mill Road. 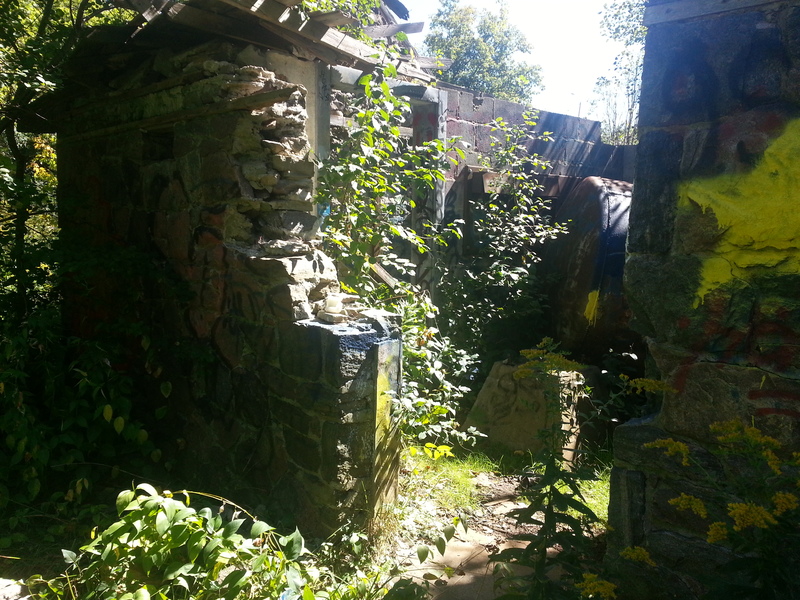 I could’ve followed the path until I reached the front of the first derelict building, but in my infinite wisdom I traveled through a thick field of tall grass and logs (and bugs!). 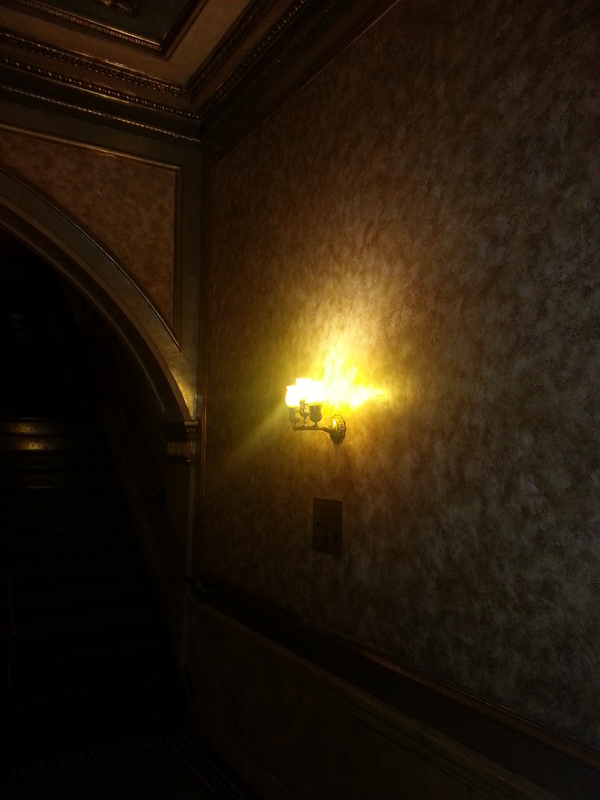 This took me to the back where I then walked around and examined it. 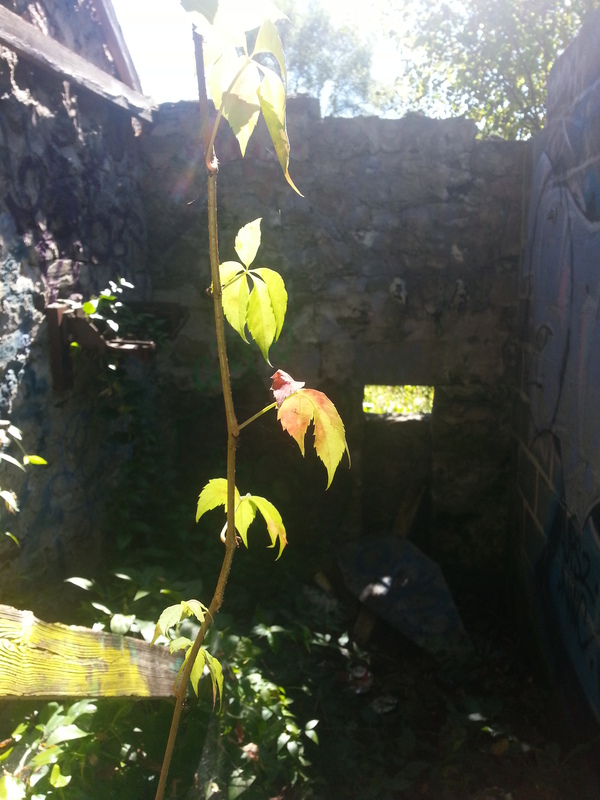 The building had the surrounding plant life growing through it, was defaced with graffiti, and was missing part of its roof. 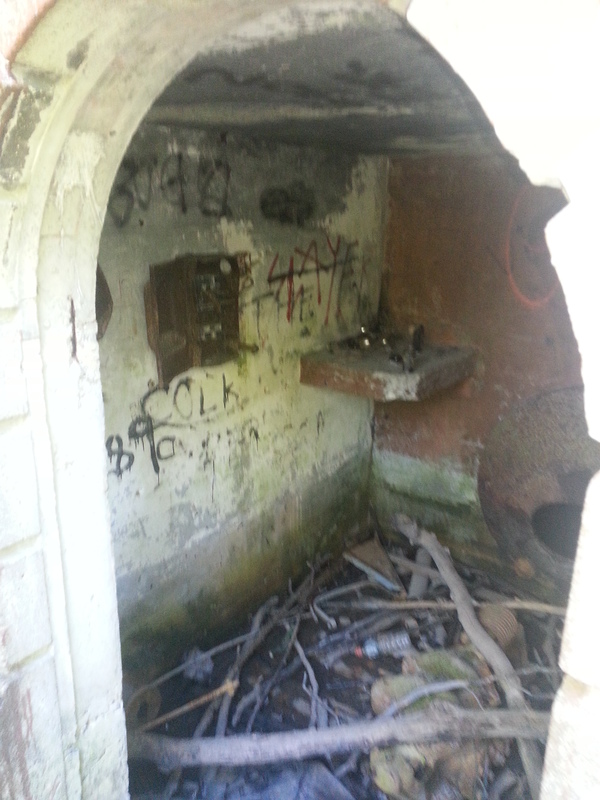 It also consists of two ‘rooms’, the main one having an industrial tank of some sort. I found a suitcase nearby which makes me wonder if someone actually camped (camps?) out there (I suggest and hope not). West of this building (I nearly missed it) is another building. This one is smaller and more in tact. It’s certainly got a roof anyways. A look inside produces a space full of debris and garbage. As for the speculation on the uses of these buildings, they are clearly industrial. Beyond that, I have none. 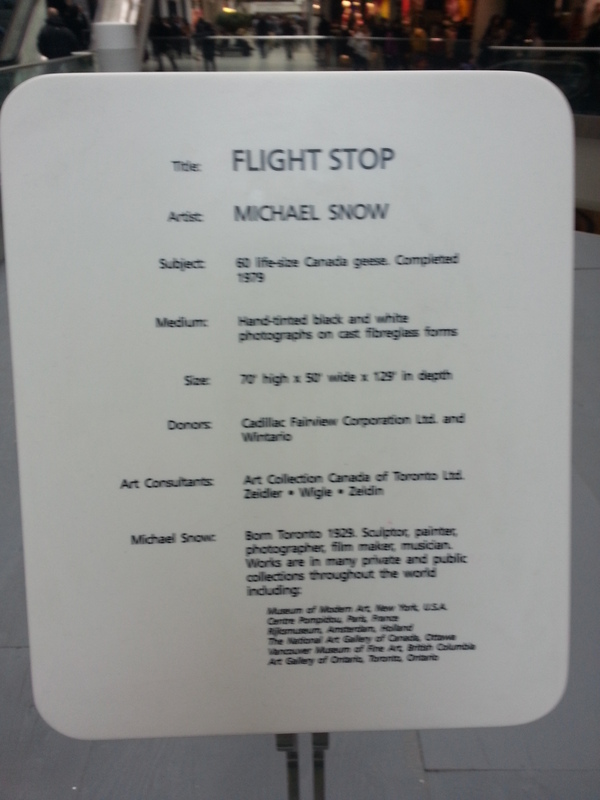 The North York Historical Society looked into them in 2011 and offered some intriguing explanations, but the status of this report is unknown. 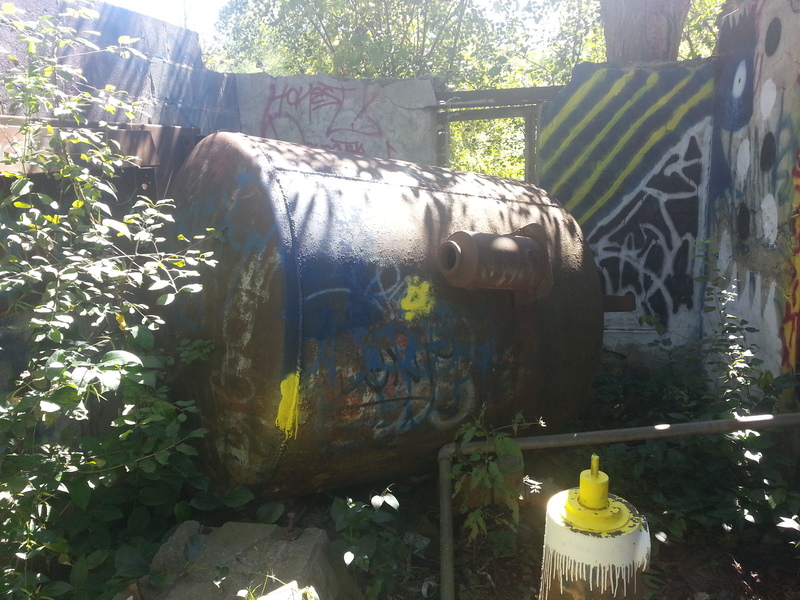 A blogger from that same year, whose post I consulted while looking for info on the Betty Sutherland Trail (and indeed first informed me of the Duncan Mill Ruins), did a bit of digging on some of the machinery in the large structure. 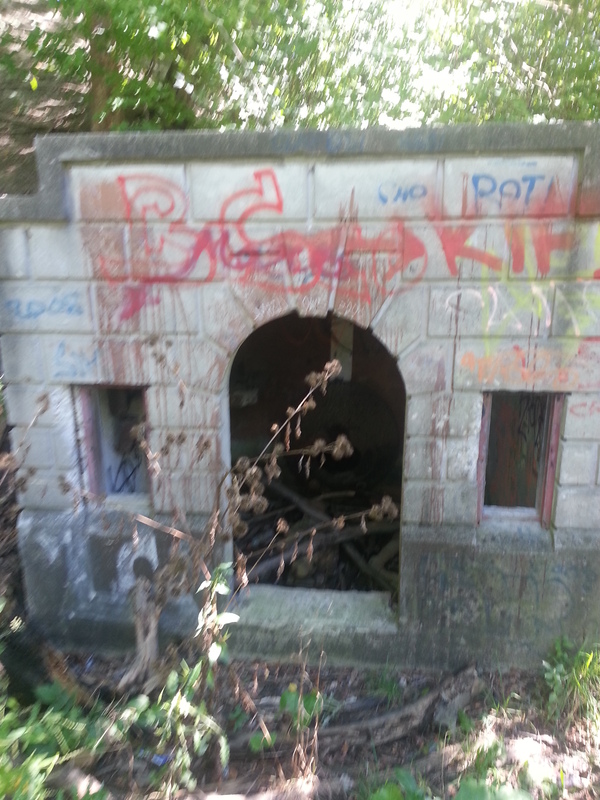 I would be very intrigued to know if the NYHS does any more work, but for now, this was an intriguing find. 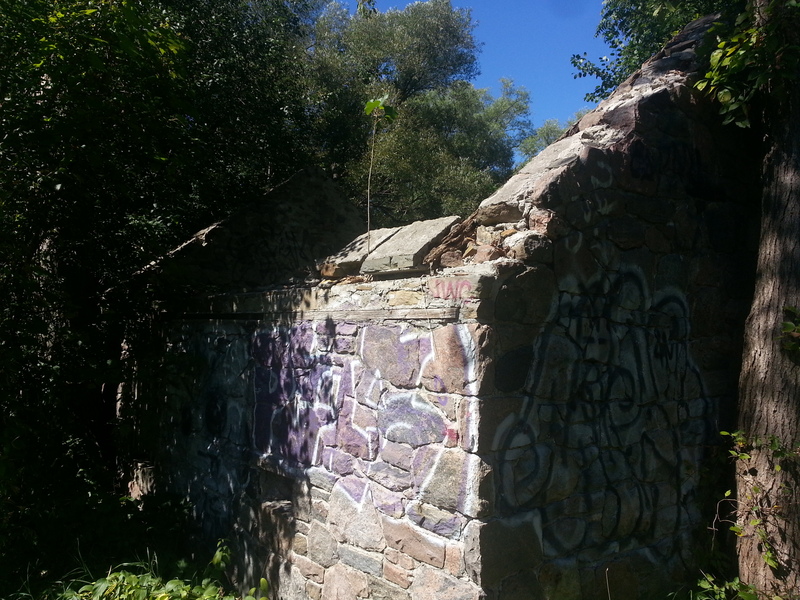 Update (December 3, 2015): Through some investigative work, Jason Ramsay-Brown of Toronto’s Ravines And Urban Forests speculates that they were a pumping house for Henry Rupert Bain’s Graydon House estate, located east of Don Mills Road! 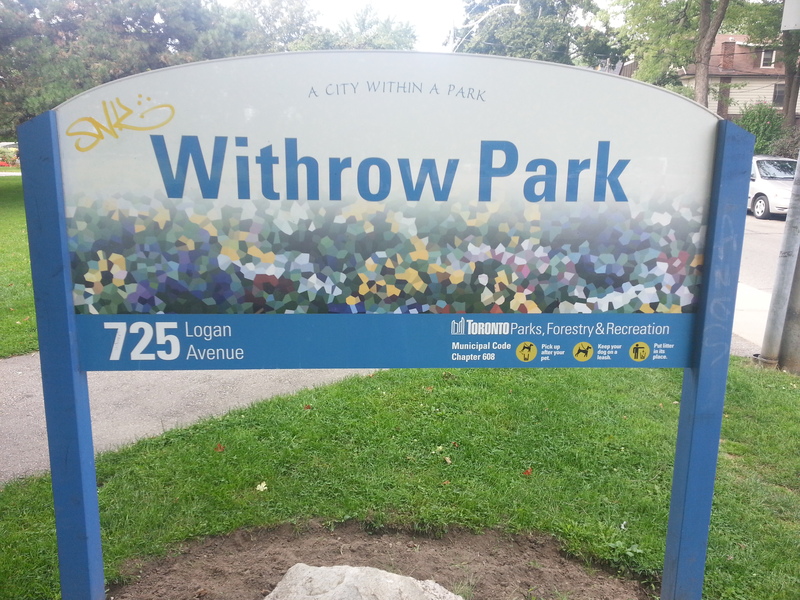 The slogan on every Toronto Parks & Recreation sign is ‘A City Within A Park’. 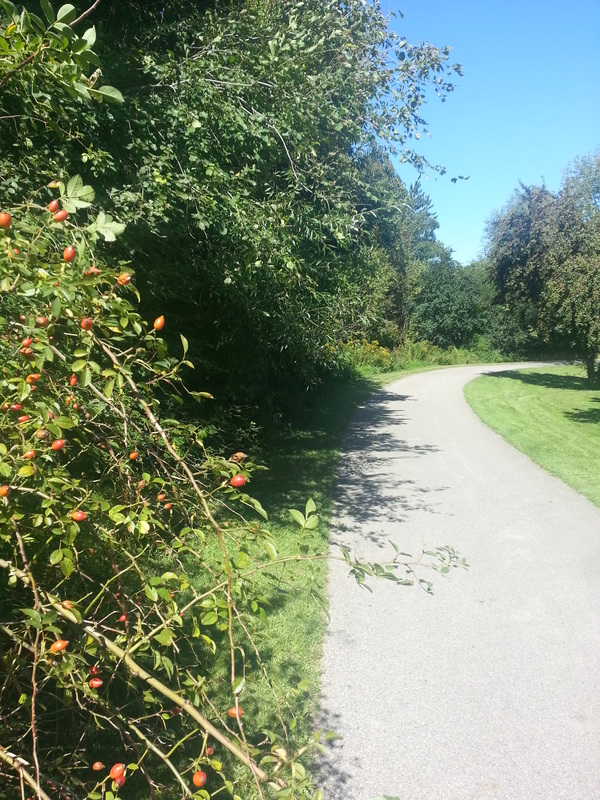 And indeed many of the city’s parks and trails involve the interplay of natural and urban environments. 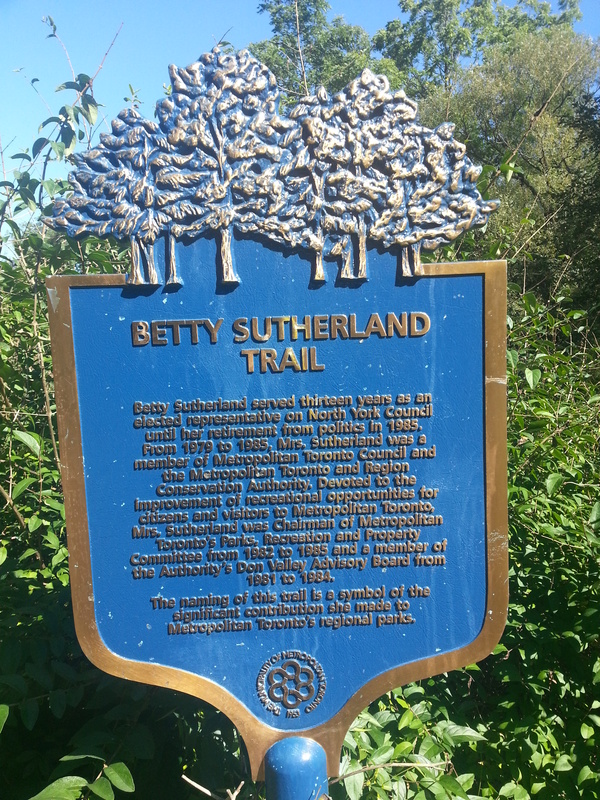 The Betty Sutherland Trail in North York is a part of Toronto network of ravines, and follows the eastern branch of the Don River from Duncan Mill Road just west of Don Mills Road to Sheppard Avenue and Leslie Street. 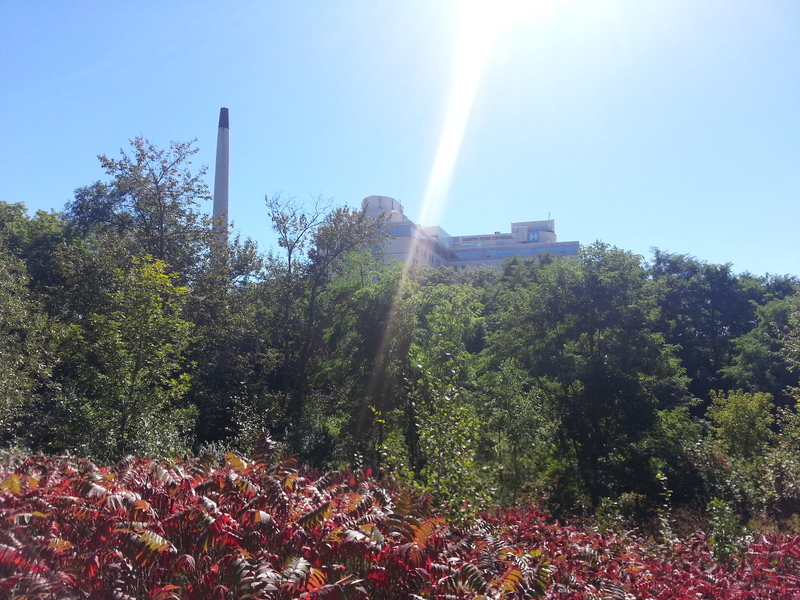 I enter from Duncan Mill Road, noting the existence of the nearby Duncan Mill Ruins. 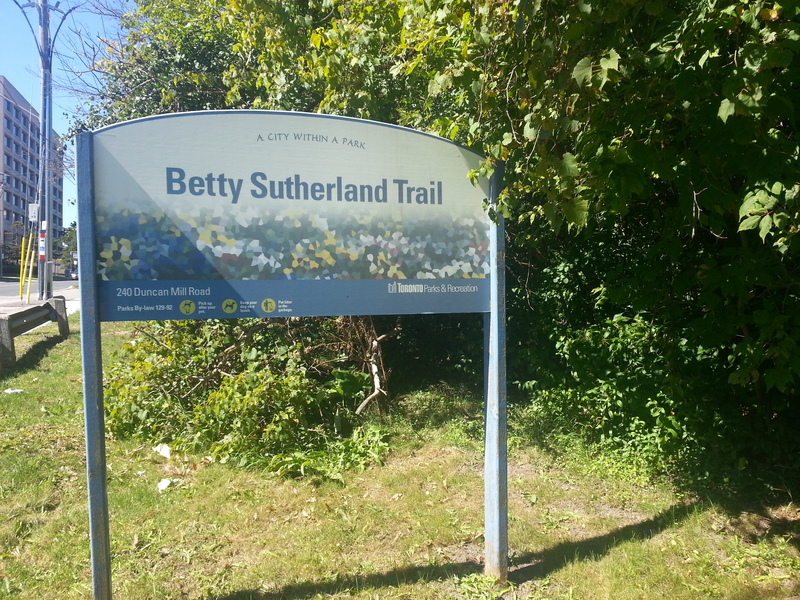 At the bottom of the tiny slope is a plaque dedicated to the park’s namesake, Mrs Betty Sutherland, who championed parks during her political career within the former municipality of North York. 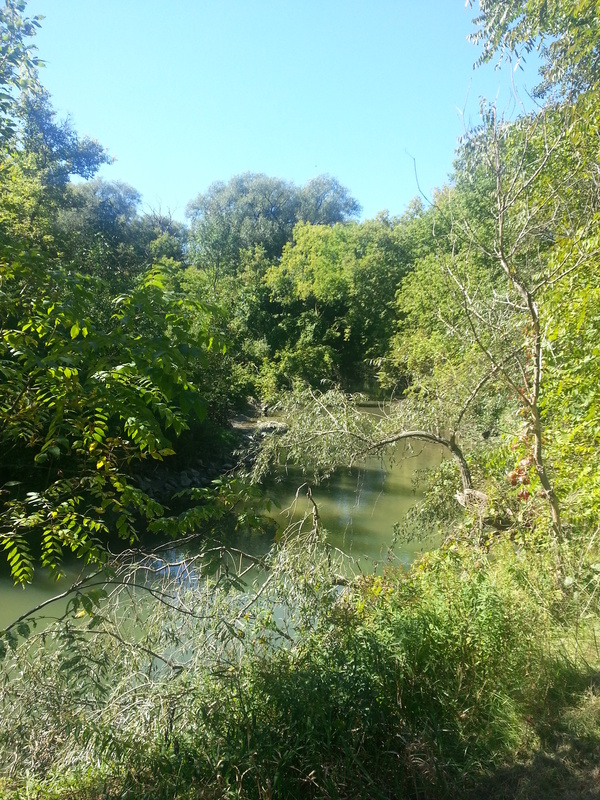 I begin my exploration by going off the trail and looking out into the river. The trail itself is rather winding at times falling right beside the river while crossing it a few times. 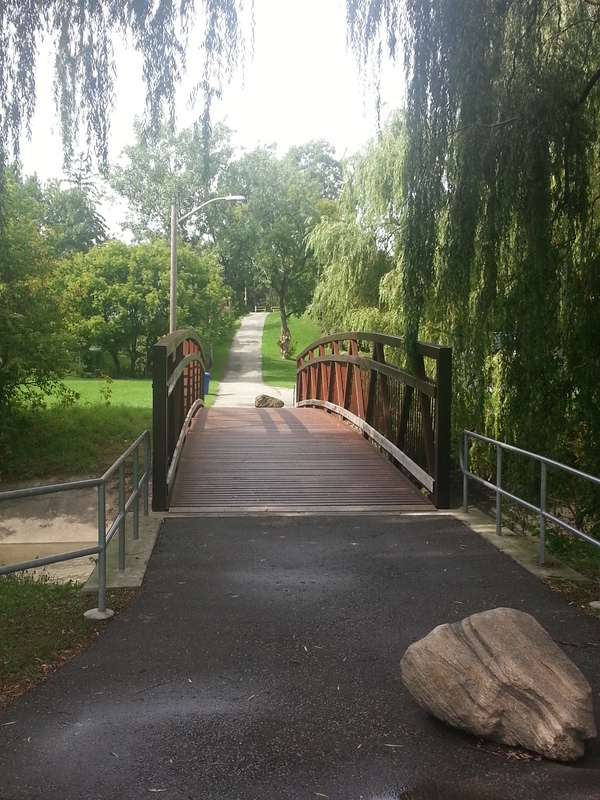 It is also well used, especially the section closer to Duncan Mill with a quite a few walkers, runners, and cyclists. 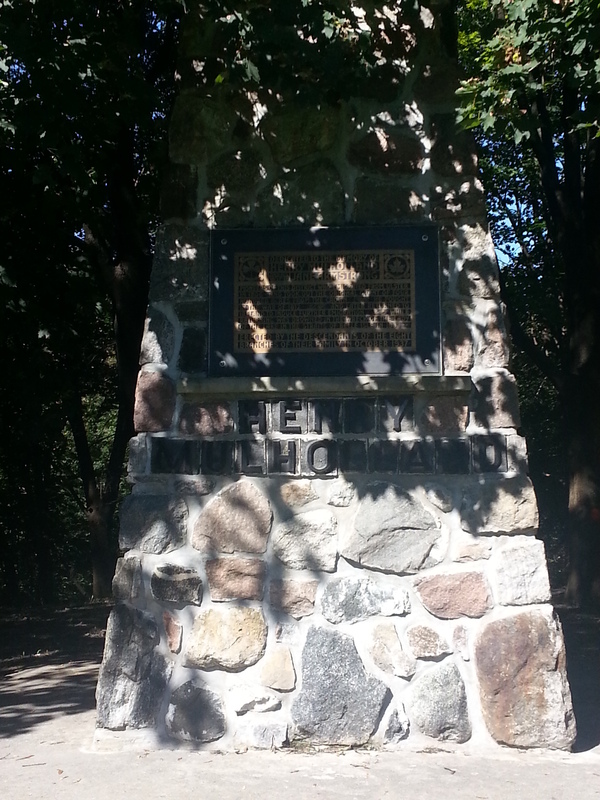 The trail also has rest points in various locations. Stopping at a picnic bench, I take out my copy of Amy Lavender Harris’ Imagining Toronto (@ImaginingTO). 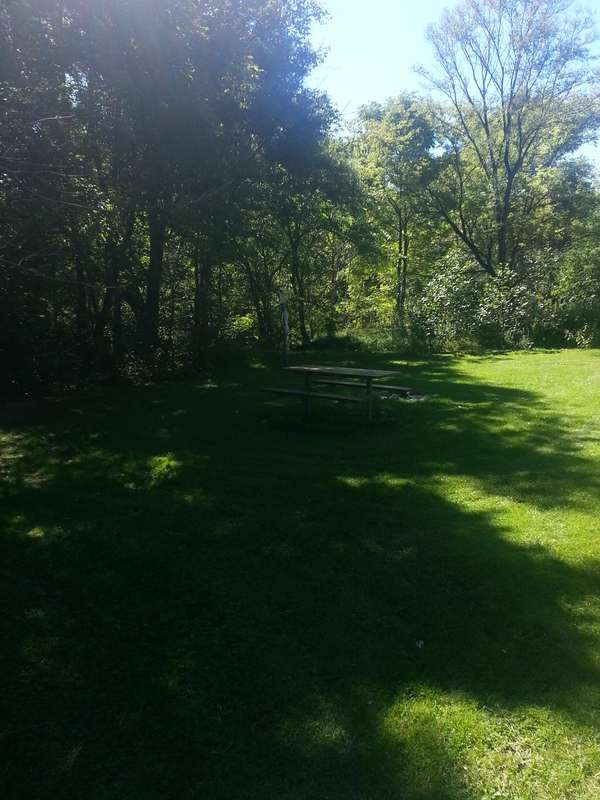 I pre-marked a specific section ‘Ravine City’ in her book which examines the portrayal of Toronto’s ravines in fiction, which I thought was very fitting considering my location. Every so often I’d stop to consider the details, such as the sometimes dark associations Toronto fiction and, by extension, Toronto writers and residents have had with these particular geological features. 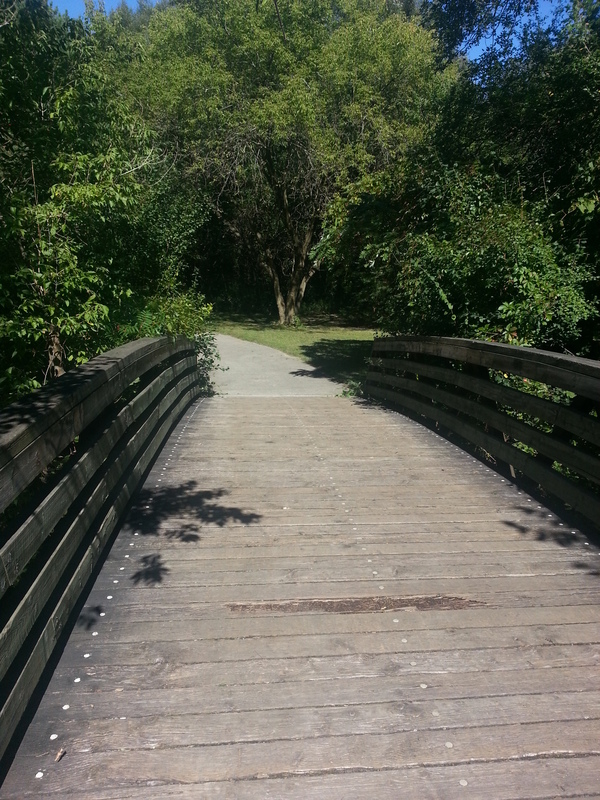 Before I can finish the section, I opt to continue my walk as mosquitoes begin their feast on me. 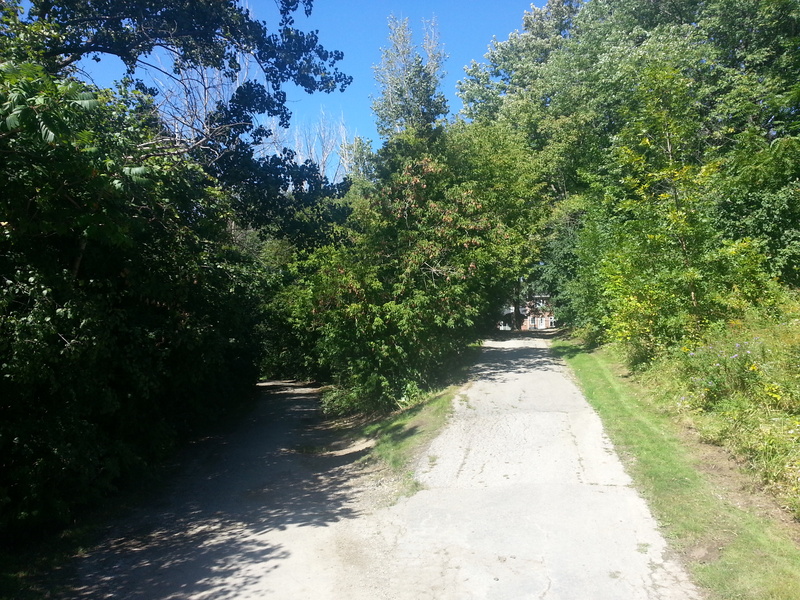 It was very odd experience burrowing deeper into this trail which speaks to this “City Within A Park” motto. On the one hand the riparian corridor and the quiet sounds of creek itself allow for a very serene time within this natural environment. On the other hand, if I care to listen, I can also hear the faint yet unmistakable sound of speeding traffic coming from the nearby 401. 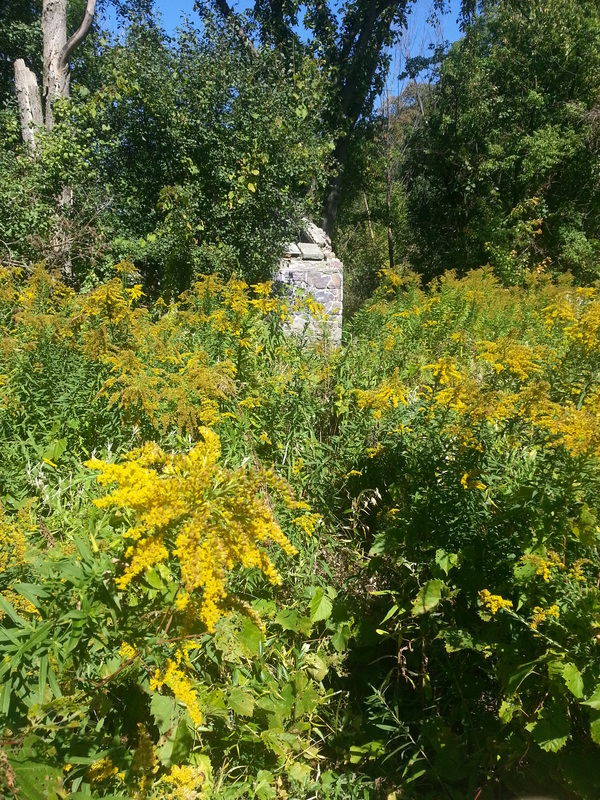 This is the strange cross section between Toronto’s natural heritage (or, at least, natural features) and the built heritage or environ around or, in this case, on top of the natural. 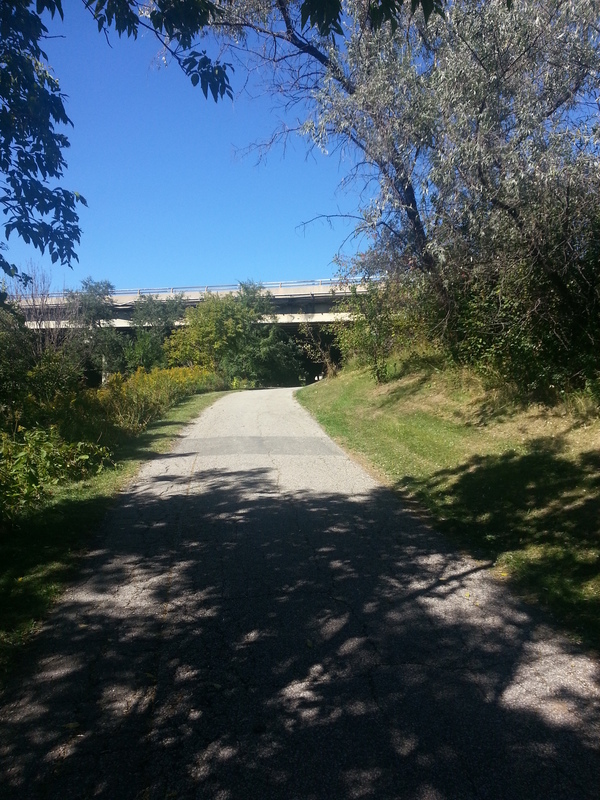 Speaking of, I pass under the highway half-way into the trail. 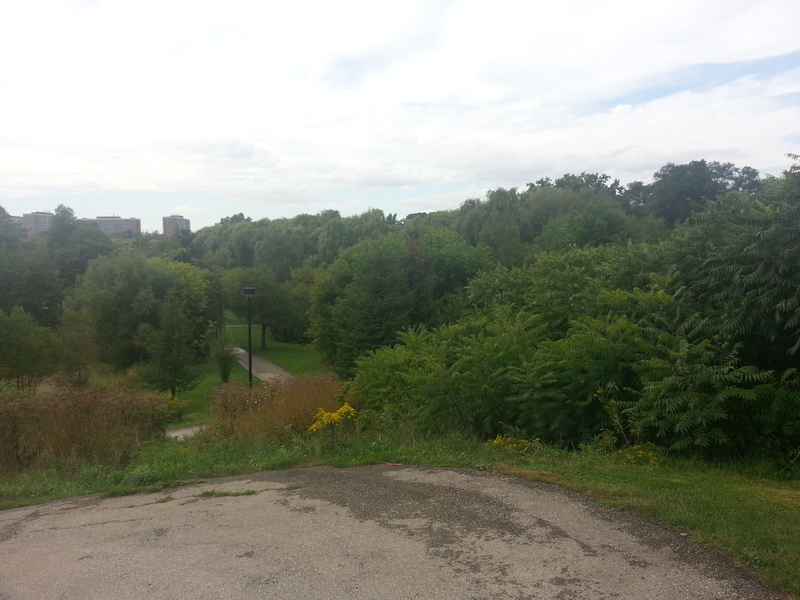 Or at least, I deem it halfway if only because it acts as the southern border to Henry Farm neighbourhood. A short while past the highway I encounter a fork in the path: one would lead up into the residential neighbourhood and the other continuing as I was. 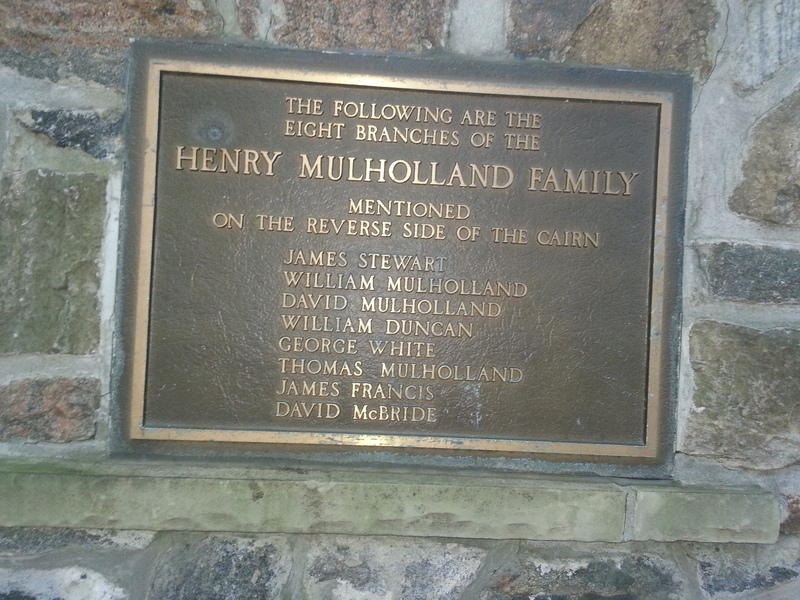 I opt to venture the streets out of the foreknowledge of the nearby Oriole Lodge, the estate house built by George S Henry, as well as the Henry Mulholland Cairn dedicated to his great-relatives. 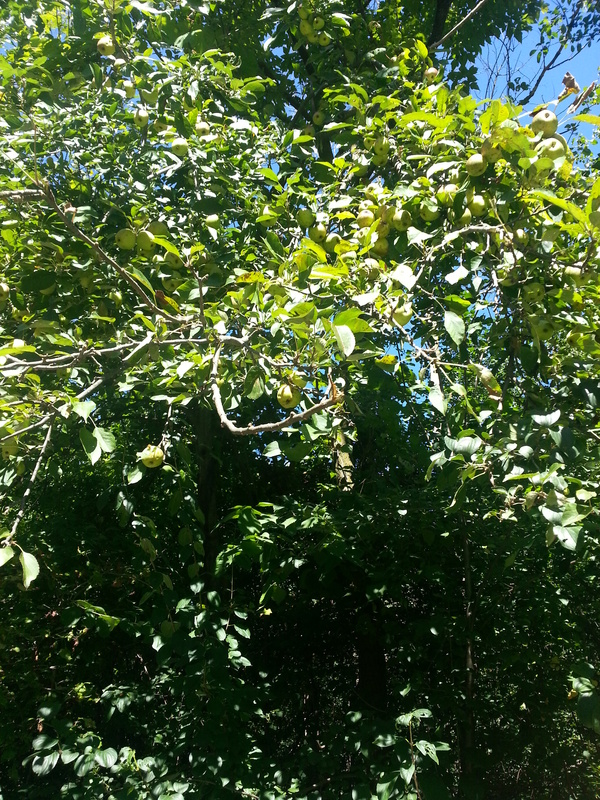 After that detour, I get back to the trail, where I encounter several fruit trees and tributaries to the river. 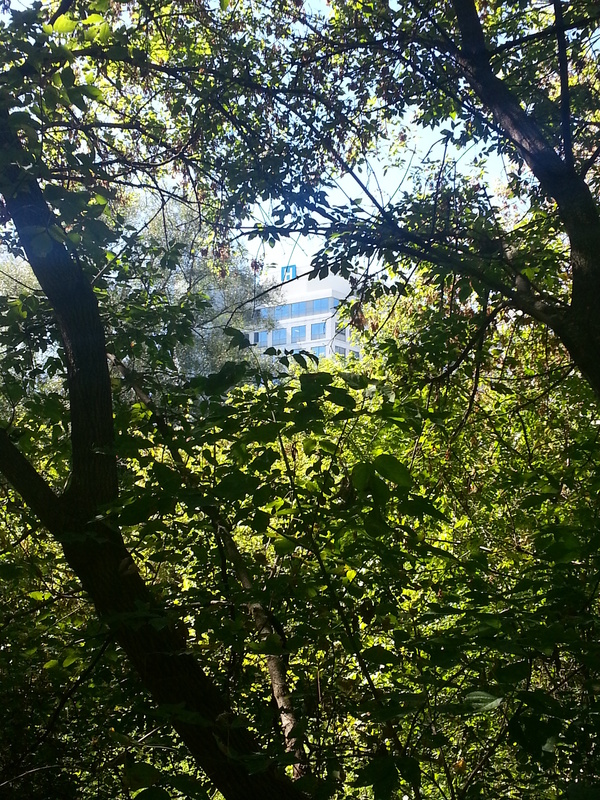 I’m also able to see, poking through the trees, the far off ‘H’ of North York General Hospital. 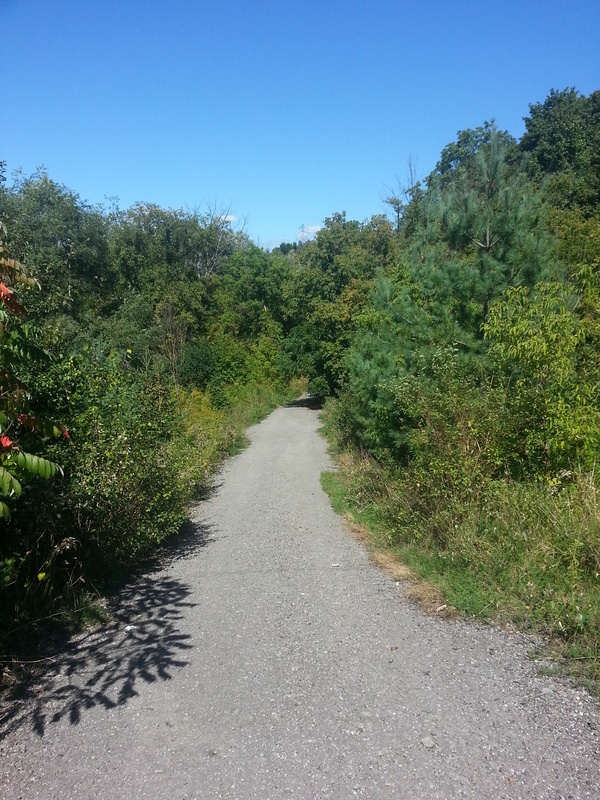 I exit at the intersection of Leslie and Sheppard, where across the street at the northwest corner I see another trail begins. For next time. 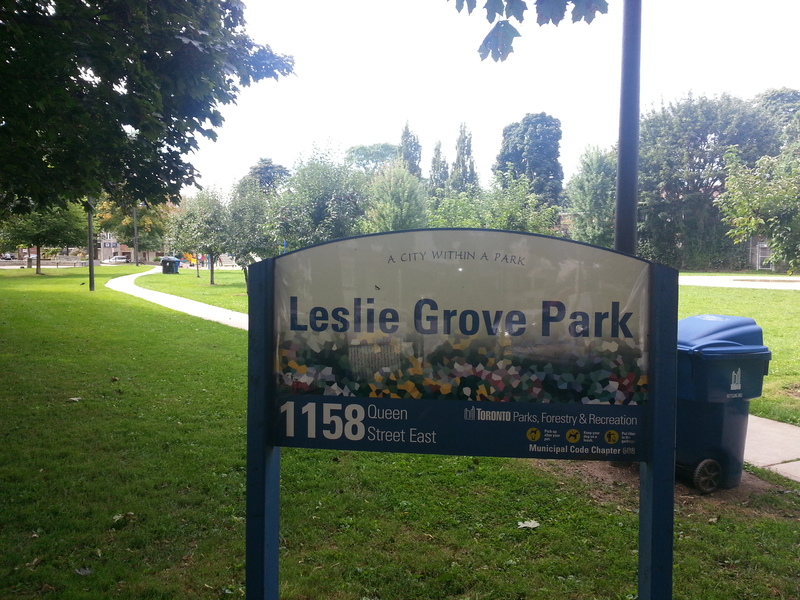 After climbing off the 83 bus at Queen Street, I walk back to the north end of Leslie Grove Park and start exploring from there. 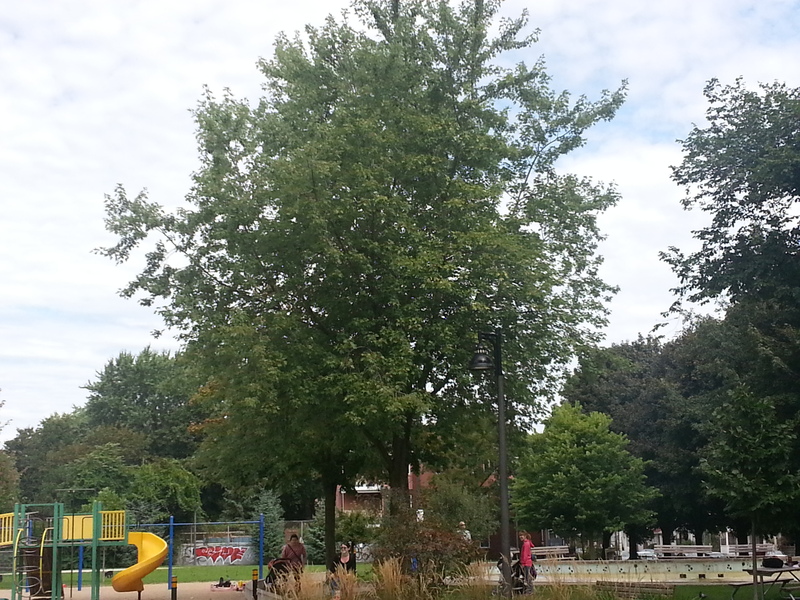 I’m immediately greeted by a series of trees lining the east side of the park (located at Jones and Queen in Leslieville) which I learn later on relate to the site’s history and founder. Moving past the baseball diamond, I am led to a splash pad with chalk designs. Beside that, a playground and a clubhouse beyond that. Like most parks, this is a very family-friendly environment. 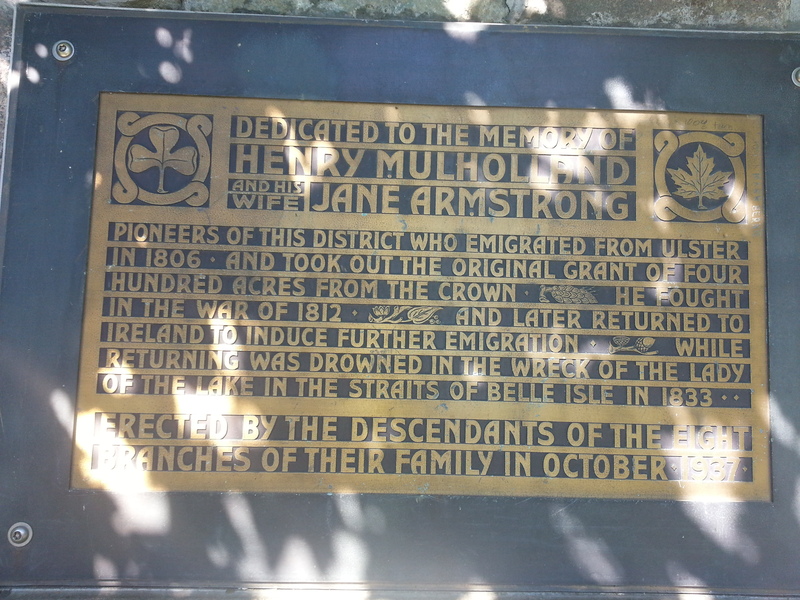 At corner of Jones and Queen, I come across a flowery path and commemorative plaque by Heritage Toronto. 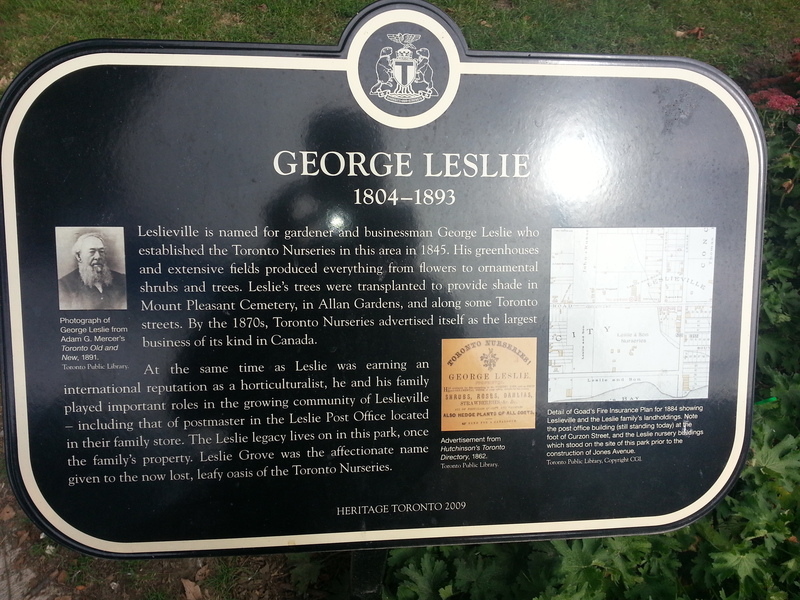 Its subject: the park’s namesake, Mr. George Leslie, and his tree nurseries which were once hosted by this site. 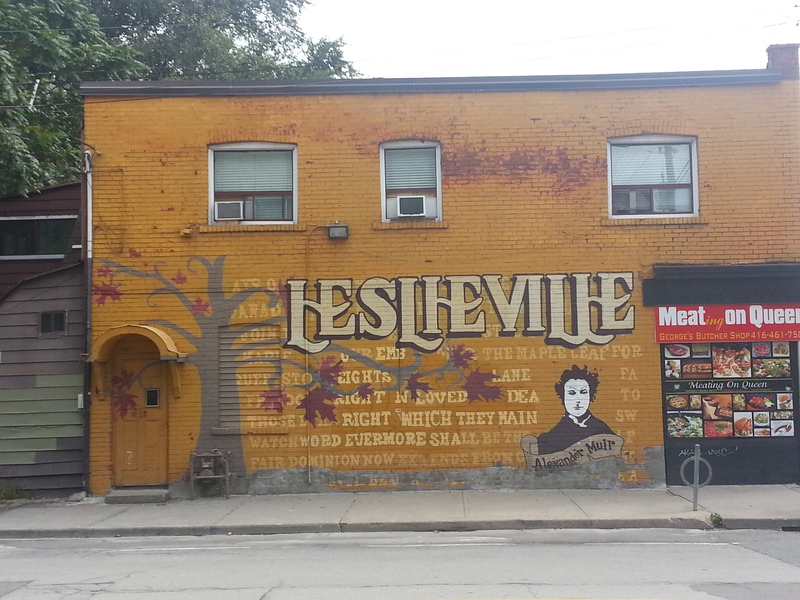 Across the street is the much photographed mural of the neighbourhood also named for him. Highlighted within it is another local hero, Alexander Muir. 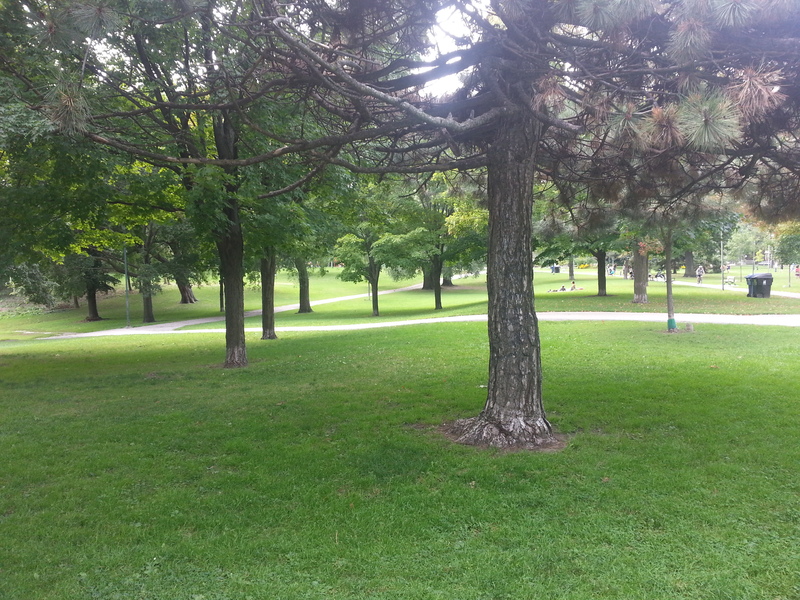 On the way out, I take a final closeup of the trees towering over the park, which is the apt location for an annual tree festival organized by LEAF, Toronto Parks, and the local City Councillor Paula Fletcher. 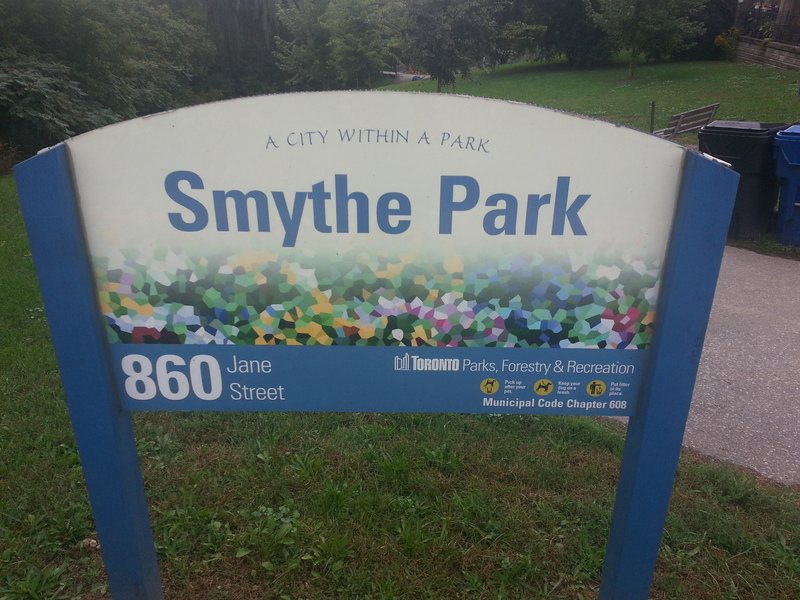 Located on the west side of Jane Street between St. Clair and Eglinton is Smythe Park. 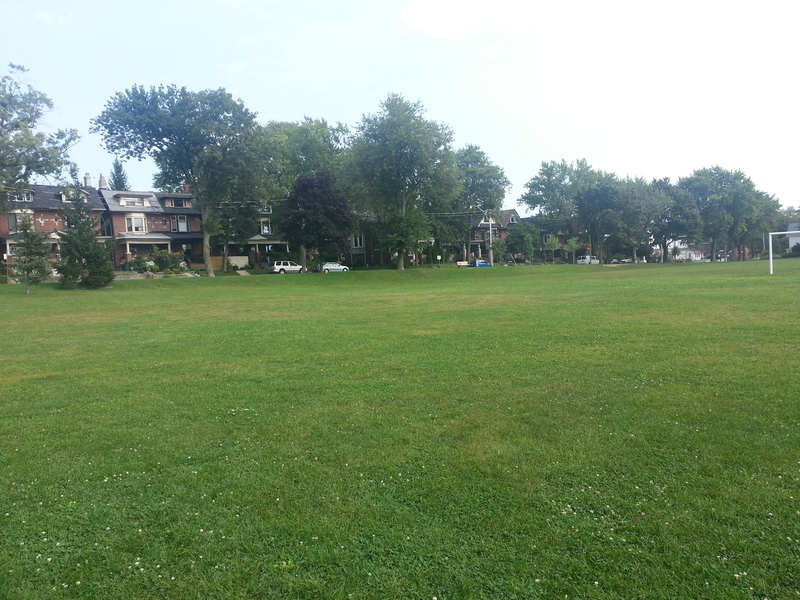 Somehow this park fits into Toronto’s sports heritage, industrial heritage, and natural heritage. The naming of this park was intriguing to me. Any hockey fan will recognize the surname Smythe as synonymous with the National Hockey League and the Toronto Maple Leafs. Indeed, Mr. Conn Smythe was at one time the Leafs’ coach, general manager, and owner, and the man who built Maple Leaf Gardens. Unknown to me was the fact that, along with running the Toronto Maple Leafs, Conn Smythe had several business operations in Toronto. 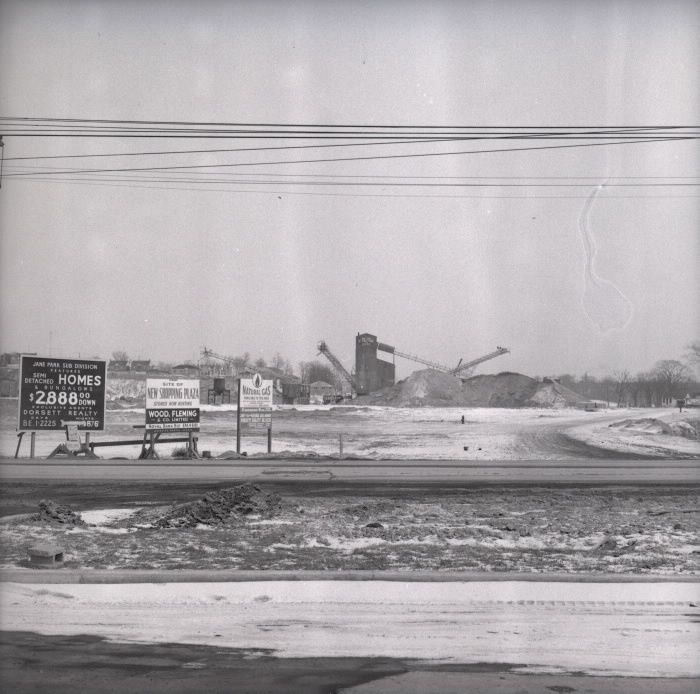 Beginning in the 1920s, one of these was a sand and gravel enterprise on Jane Street – a very lucrative one at that. 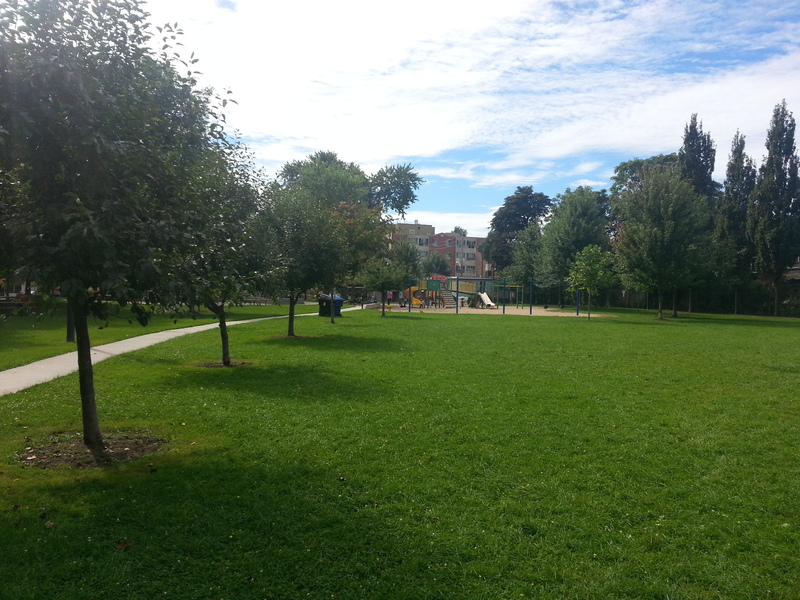 Smythe Park sits where that operation once was. 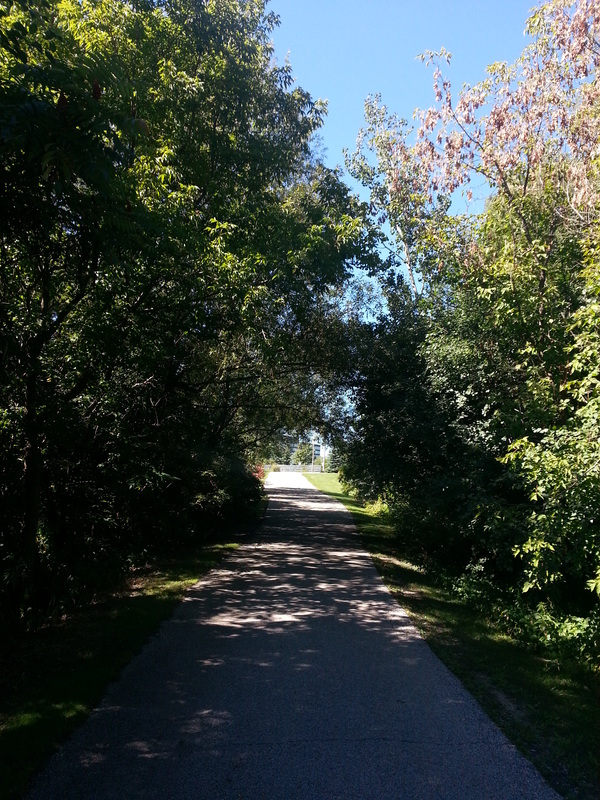 Following a descent north of the creek, I follow the path – the aptly titled Black Creek Trail – into the park. 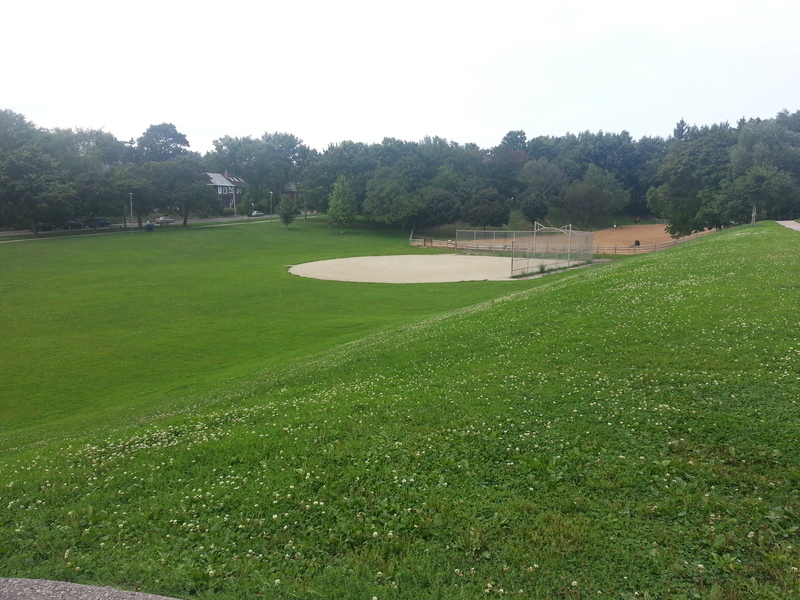 To my right there is a baseball diamond. 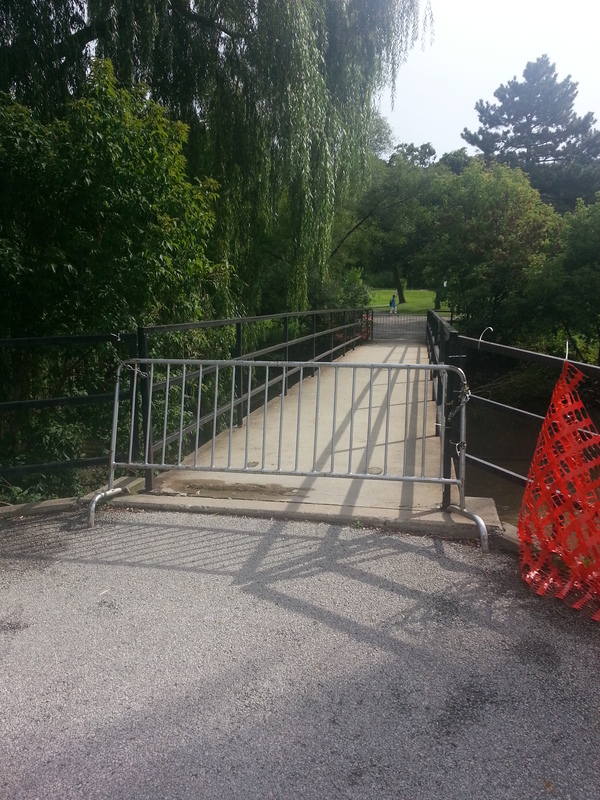 To my left, a bridge (the first of two in the park) across Black Creek is gated up and inaccessible. The downpour from earlier in the day has left the path wet and puddled, but it is an otherwise a nice walk. 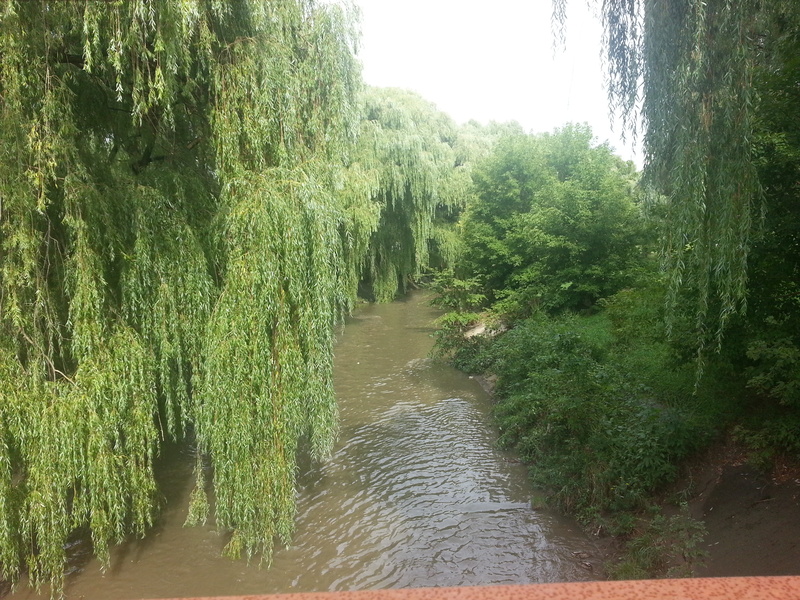 The willow trees that hang adjacent to the creek make it somewhat scenic. 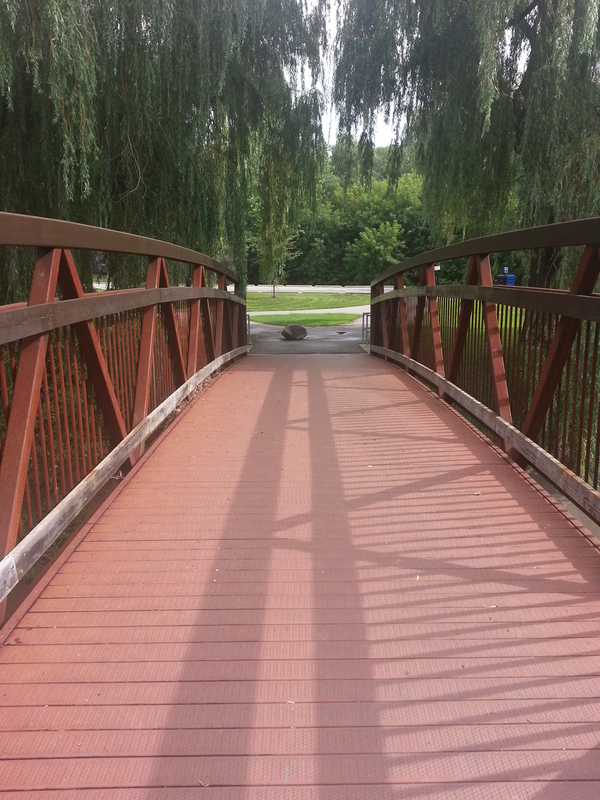 I come to a second bridge, which at first glance are marked with two randomly placed giant rocks at either end. At closer inspection and deliberation, they are tributes to the industrial heritage of the area – and a reminder of the remarkable transformation from a quarry to a park. 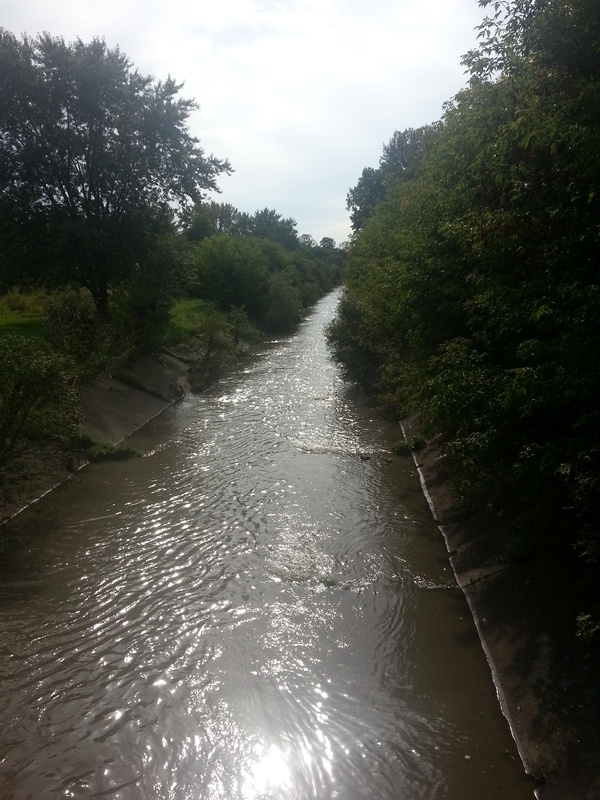 I look through the bridge’s unexpectedly high railings and see the muggy, depleted, manipulated, flowing creek. A look on the other side of the bridge produces a view of the park’s outdoor pool facility. I follow the path up a very windy climb back to Jane Street, stopping to look down into valley – no doubt dug in from the gravel quarry. 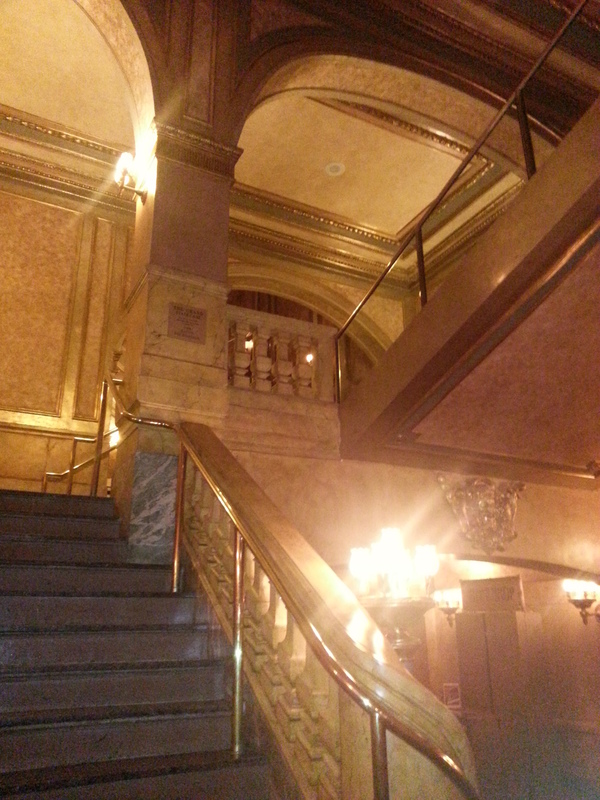 The Elgin and Winter Garden Theatre Centre is a very intriguing Toronto landmark. In addition to being perhaps the only double-decker theatre left on the continent, it is also a National Historic Site (NHS) as of 1982, making it a cultural icon on a national level. Beyond its significance as a modern performing arts centre and a movie house before that, it houses the greatest collection of 1920s Vaudeville props and sets. 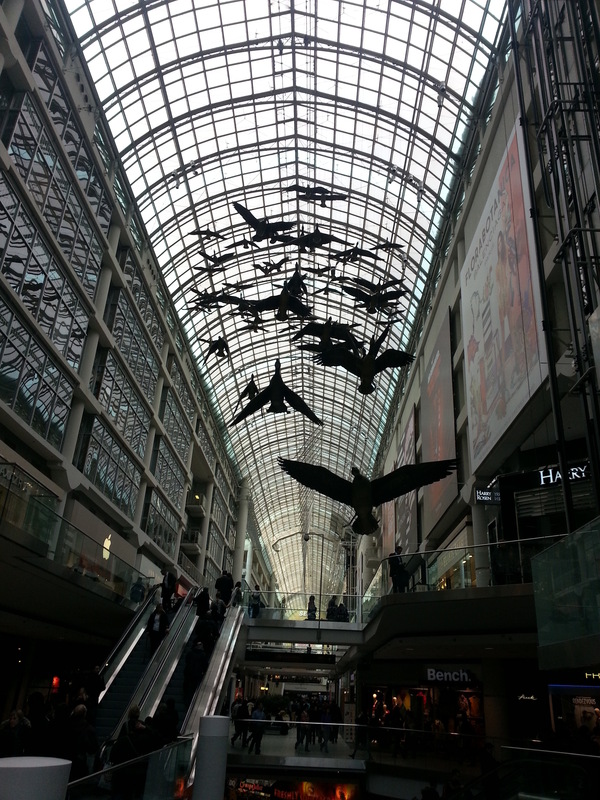 Unlike most National Historic Sites which have undergone adaptive reuse as museums (Fort York) or commercial establishments (The Distillery District), the Elgin and Winter Garden continues to be a fully functional, money making enterprise. This presents an interesting situation because as a NHS it must protect, promote, and manage the heritage values – while also existing as a living venue whose primary goal is to put on productions and attract paying visitors. The Centre was designed with allure of grandeur. 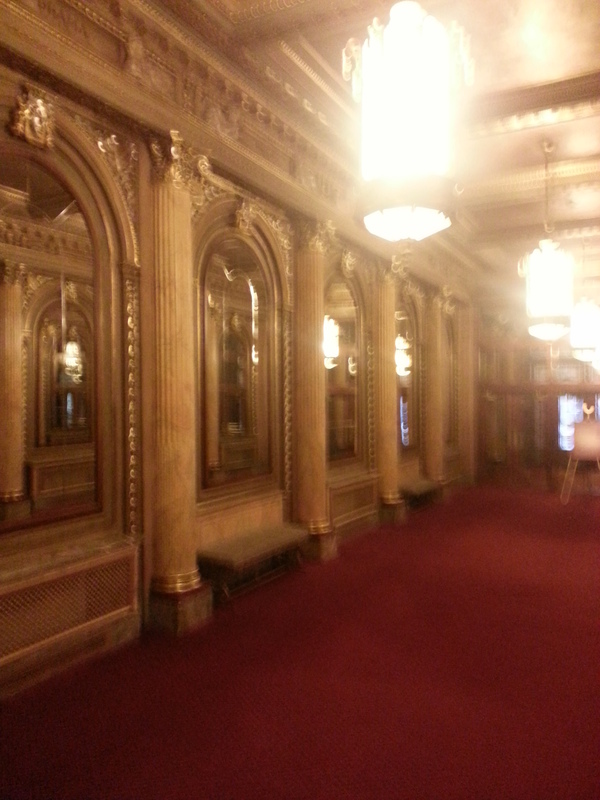 The ornamental gold on the walls and the marble columns are just that – finishes. 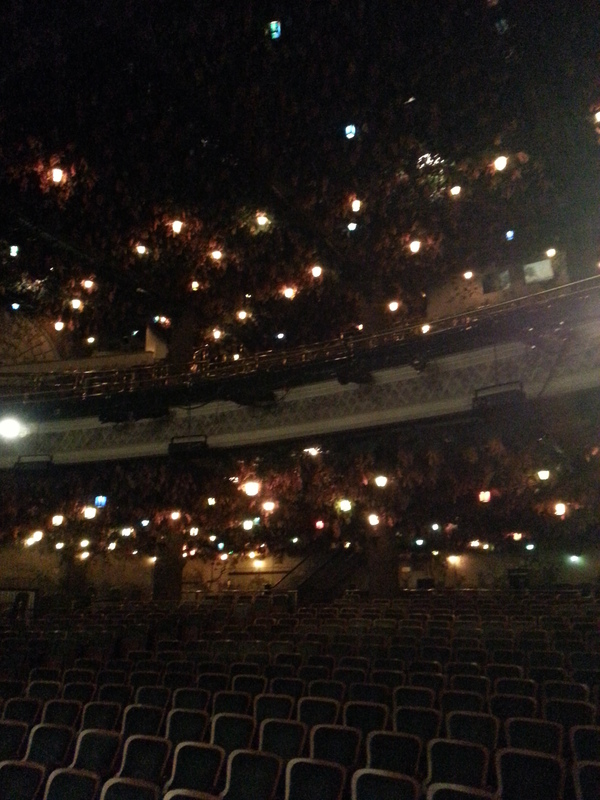 Being at the Centre is as much about witnessing a spectacle inside the theatres themselves as much as it outside of them. Managing the heritage aspects of the theatres while trying to keep it operational I learned is a tough task if only because one encounters heritage everywhere. I found out that it is about finding a middle ground, a compromise – being the least invasive. Often this involves creative solutions to issues. 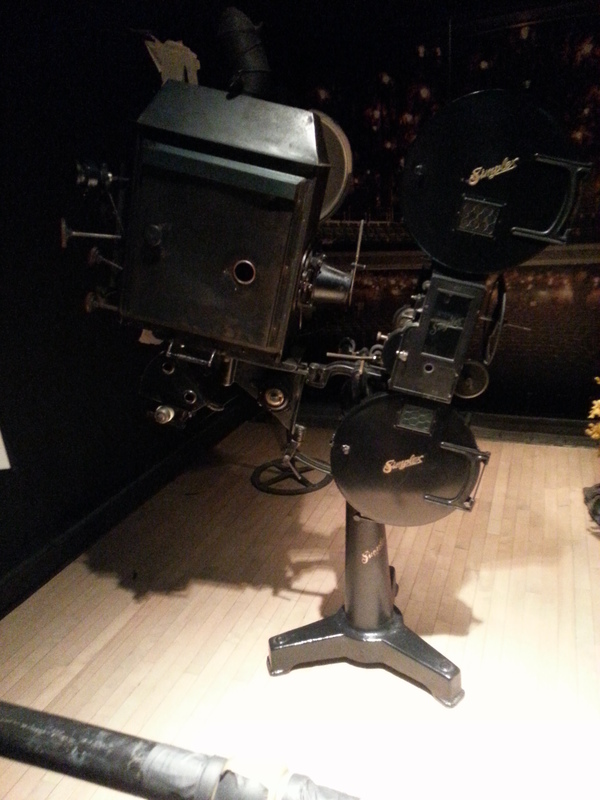 The Winter Garden Theatre was closed in 1928, which left it in a time capsule until the Ontario Heritage Trust rescued and restored both theatres in 1981. The walls, which had taken 50 years of dirt, had to be cleaned with bread dough so as to not disturb the designs underneath. The leaves hanging from the ceiling (barely visible in the darkened picture) had to be made fire proof because they are otherwise a hazard. 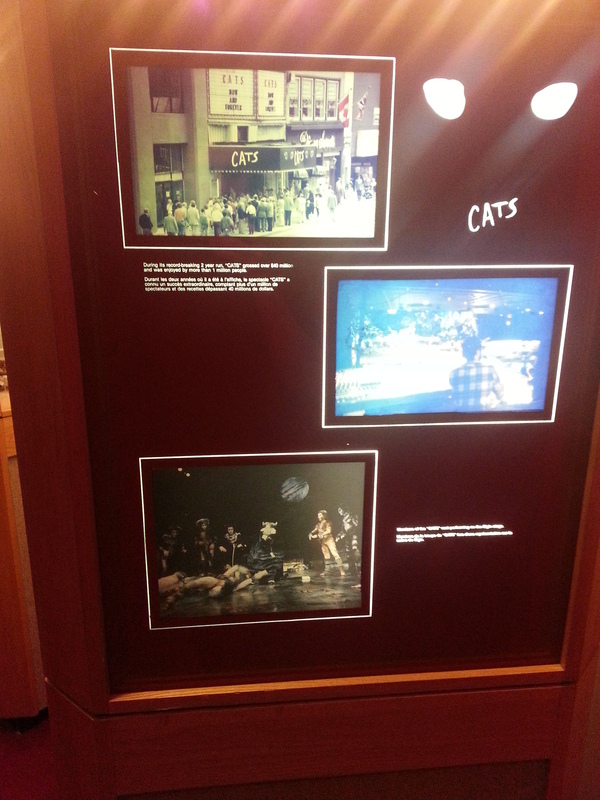 The theatres have museum-like elements with a number of exhibits including the original camera and electrical panel backstage and information on the famed shows (including the wildly successful “Cats”) that have graced its stages. 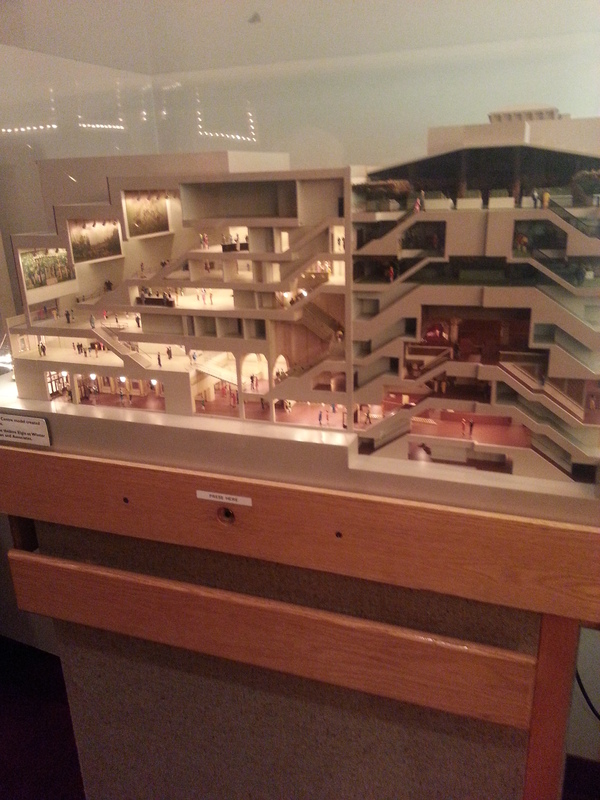 Notable is a detailed model of the entire complex. It’s fun to note that the theatres themselves were built to front onto Victoria Street because real estate was more highly priced on Yonge Street (like it is today). With the 100th anniversary of the Elgin Theatre this year, there have been more opportunities to showcase its animated history. Special thanks to The Architectural Conservancy of Ontario‘s Next Gen group for allowing this inside look. 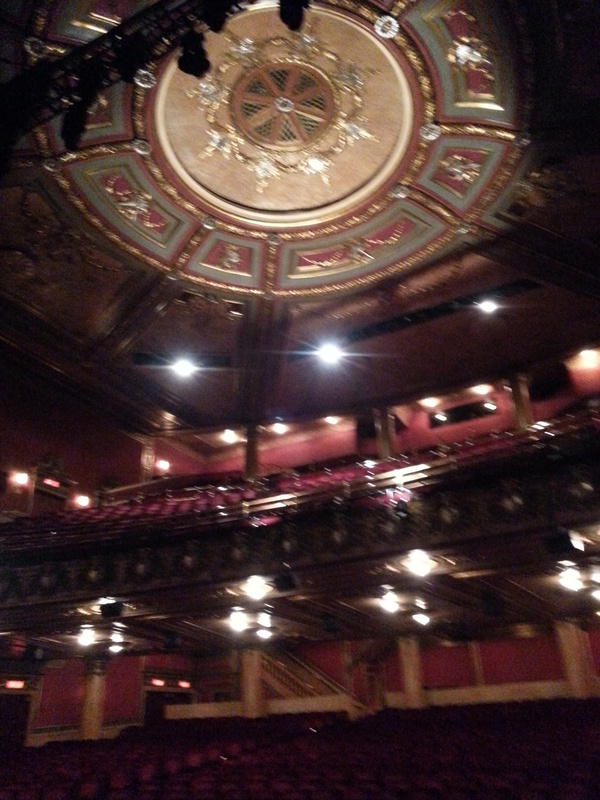 They allowed me pleasure of shadowing the General Manager, Brett Randall, as well as some of his staff at the Elgin and Winter Garden Theatre National Historic Site. The multi-perspective insight on how to run a heritage site and a performing arts venue was a treat. 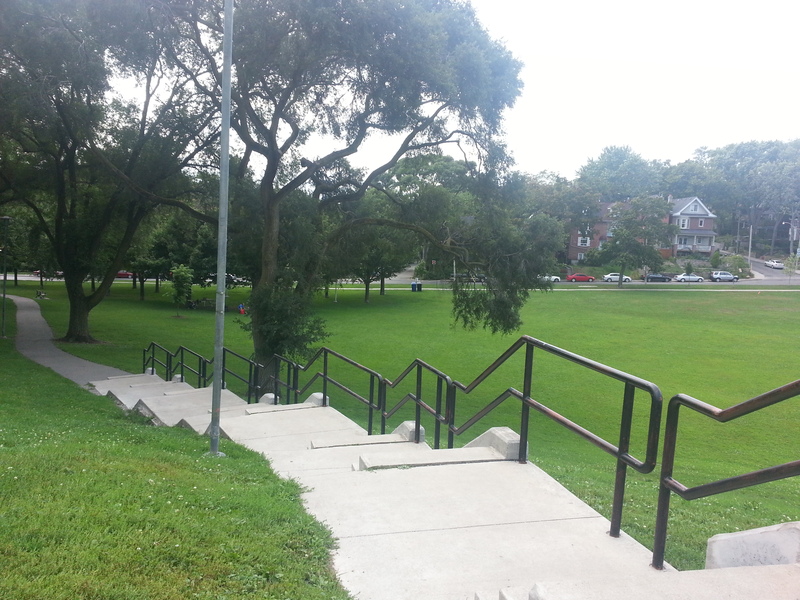 My introduction to Withrow Park was by nearly interrupting a wedding shoot. In doing so, I unknowingly also stumbled into the essence of this sizable park. 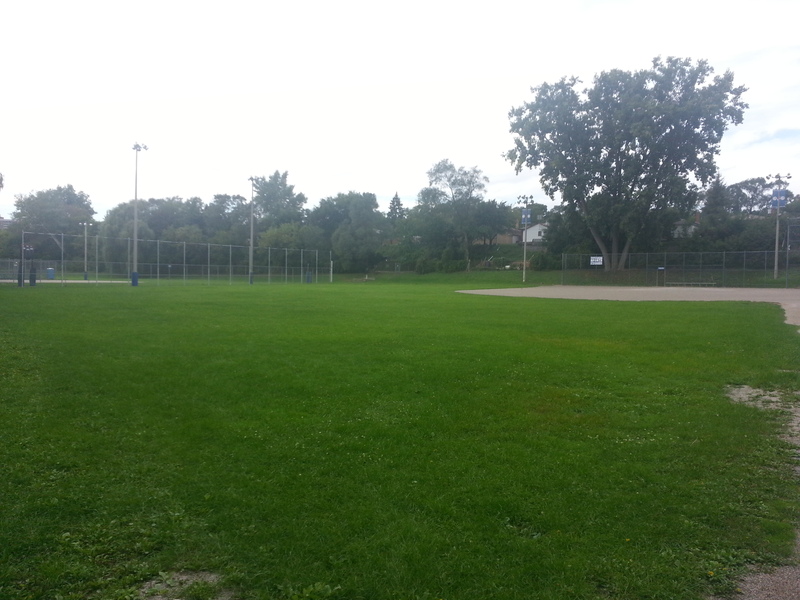 Entering the park from the south end at Carlaw Avenue, I immediately saw people tossing and hitting a baseball in the soccer field. 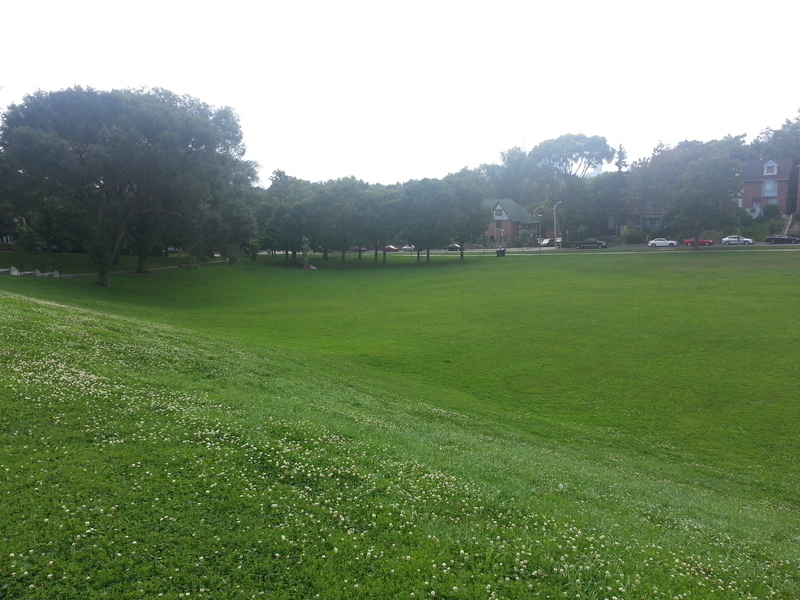 As I ventured past the wedding party, the great slopes reminded me of the other parks in the east end – Riverdale Park East to the west and Greenwood Park further east. On its toboggan-friendly hills I saw people reading books and in the valley below, picnickers enjoying a late lunch. 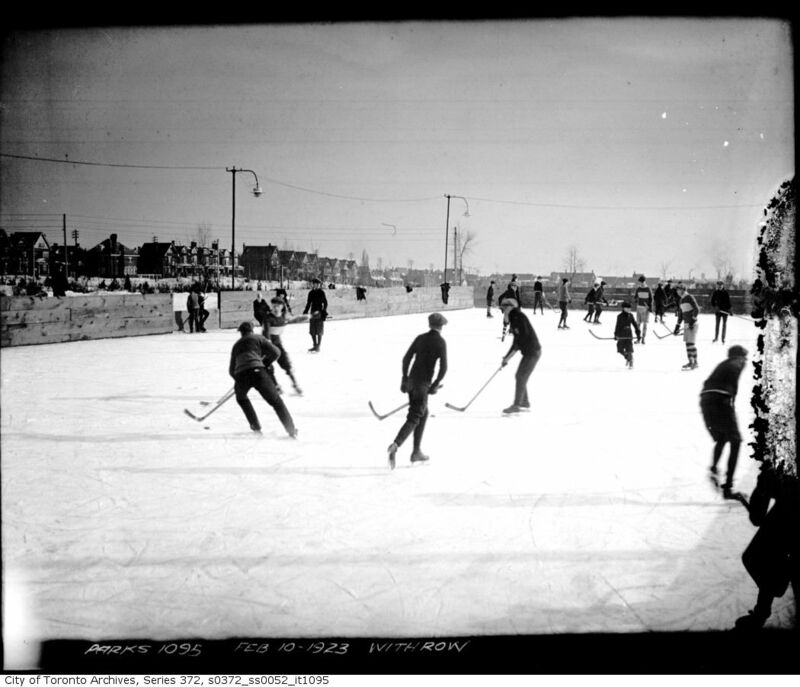 Traveling around the side of the soccer field, I noticed a hockey rink, which I later (and delightfully so) discovered was the site of Toronto Maple Leafs outdoor practice a few years ago. 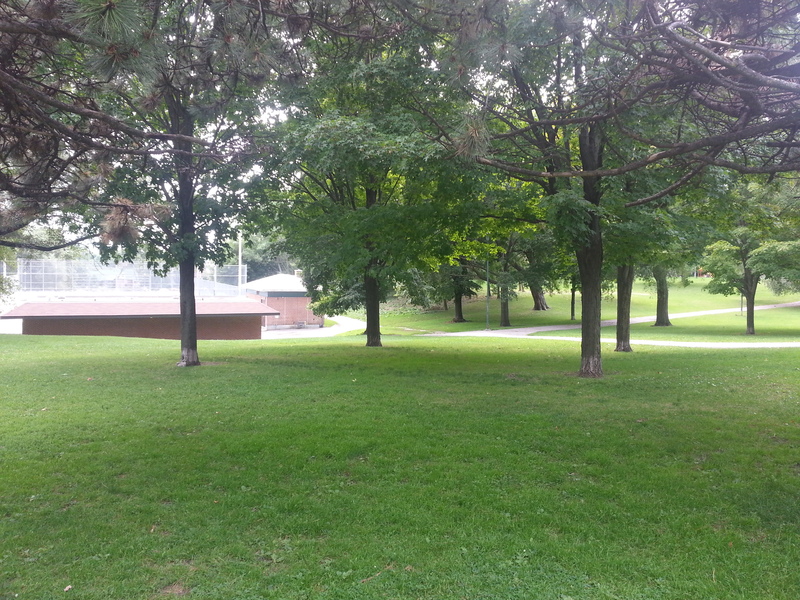 North of the rink was the path-ridden, tree-covered portion of Withrow Park. If the area I came from was the subdued side of the park, this was the lively portion. Bicyclists, parents and children on family outings, and adolescent revelers took in the great afternoon. It made for a delightful stroll, and one which necessitated a return with company. It was also here where I re-affirmed how parks bring character to a neighbourhood and become focal points in how we build communities. 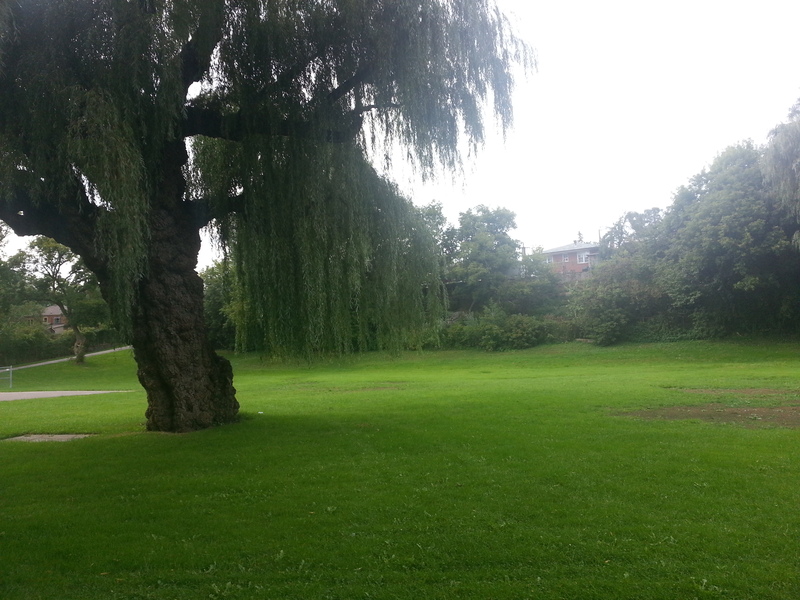 Withrow Park does just that. 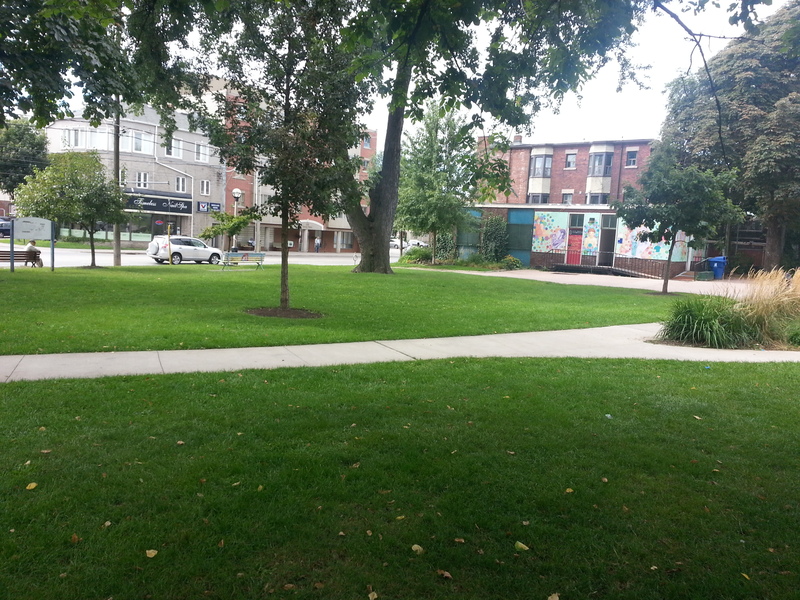 Withrow Park recently hosted a Shakespeare in the Ruff and continues to hold a Farmers Market every Saturday from now until late October. These tidbits capture the essence of this public arena: that it is a multi-acre park enjoyed by a multitude of people in a multitude of ways. 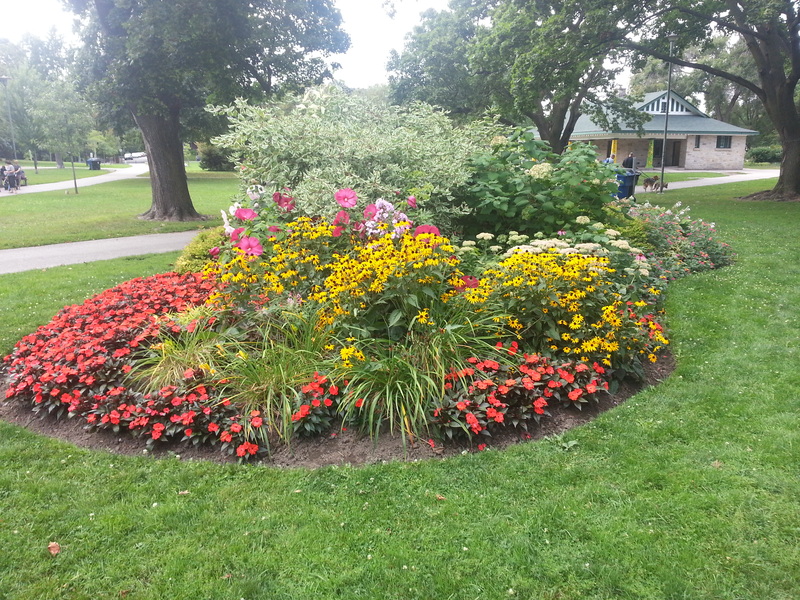 With this decade, Withrow Park celebrates on hundred years of serving the Riverdale community and the hoards of residents over the years. 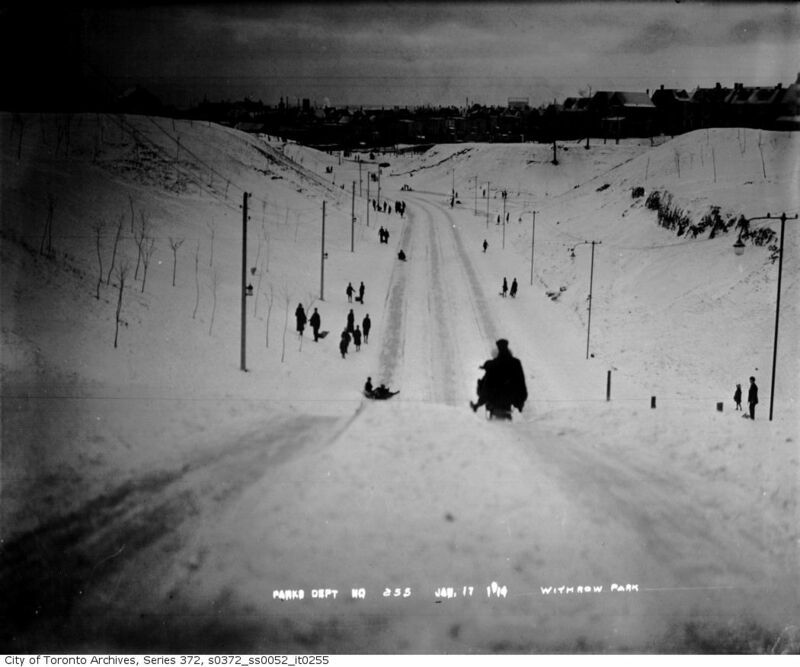 So beyond its many uses by many people in this lifetime, its sledding hills and skating opportunities seem to link multiple generations with one another.